Featuring some of the world’s most popular sports in one title, game night will take on a whole new tone as up to four players swing, kick, dunk, charge and skate their way to victory. Six sports are represented for a combined total of 22 events, each using instinctive controls that mimic real athletic movement with the Wii Remote. Each sport – tennis, basketball, football, soccer, lacrosse and hockey – has its own kind of "hit the shot at the buzzer" kind of heart-pounding action, and this is exactly what Big League Sports captures. This is the perfect party game or family activity. 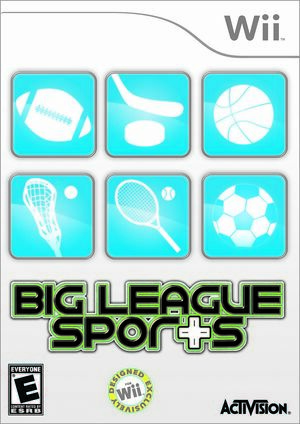 Big League Sports allows up to four players to compete in a variety of modes, including single game, marathon and tournament modes that offer hours of non-stop action. Players can also view their statistics and overall progress, as well as the trophies they have won. A character creation feature allows players to craft a character to their liking with dozens of customization options. The game is known as World Championship Sports in Europe. The graph below charts the compatibility with Big League Sports since Dolphin's 2.0 release, listing revisions only where a compatibility change occurred. This page was last edited on 6 January 2019, at 00:44.